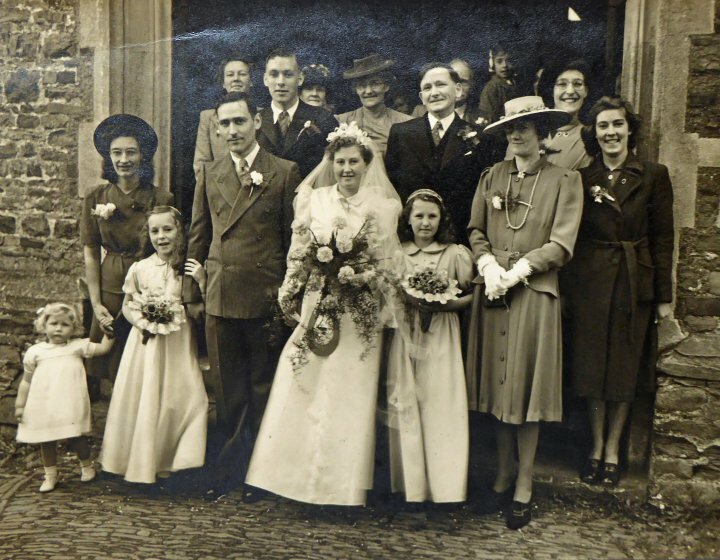 In May 1945, Patricia Ruth Stevens, the older sister of Eric John 'Steve' Stevens, was married to Arthur Douglas Lemon in St Mary's Church, Pilton. In this picture we can identify Arthur and Patricia (the bridegroom and bride) with the bride's sister, Jill Elizabeth Stevens, and her mother, Lilian Mabel Stevens, to her right. Behind Jill is their father Herbert John Stevens. The photograph has been contributed by the brother of Patricia and Jill, Eric John Stevens, who was absent because he was still away at the end of World War II when he had served in the Royal Navy. Thanks to 'Steve' Stevens for this photograph.